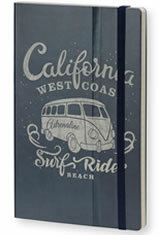 The Stifflexible Vintage Surfing notebooks have a Southern California surfer themed cover. Created with a hard stiff cover that is also flexible and bends at the ridges. The inside has 192 5 x 8-1/4" pages of 80g acid free ivaory paper. 144 of the pages are lined, 32 are blank and 16 are detachable. Included is an inner pocket/bookmark with a cardboard ruler. The Stifflexible Vintage Surfing notebooks has been FSC certified so you know they are environmentally friendly. The Stifflexible Vintage Surfing Medium Memo & Notebooks usually ships within 1 business day unless otherwise specified. Each Stifflexible Vintage Surfing Medium Memo & Notebooks we sell is guaranteed to be genuine, authentic and will arrive brand new & unused!